The Albion Club is run by unpaid volunteers and enthusiasts and is open to everyone interested in Albions, whether owners or not. 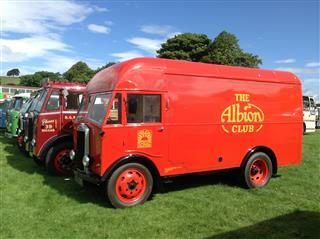 Access to the Albion archive, one of the UK's best and longest established commercial vehicle archives. Assistance with DVLA for number plate reinstatement. A Warm Welcome at The Great Biggar Rally every August. You will be helping to keep the Albion memory alive. The first magazine each year is in April, followed by July, October and January. If you join after April, you will be sent any back-issues you have missed since April. For the following year, your renewal notice will then be sent with the January edition. Print a membership form for posting. Alternatively, you can pay by paypal for one year's membership (starting from April of the current year) by visiting our Shop.